116 I WRAPS I 2015 O ver the last six years there has been an explosion in colored wrapping films. As time has passed we have seen an evolution in the types of films that are being produced. Everything from the first matte black films to chrome, alligator, carbon fiber and color changing/shade shift, metallic and glitters, just to name a few. Each year there are new and amazing vinyls being produced. 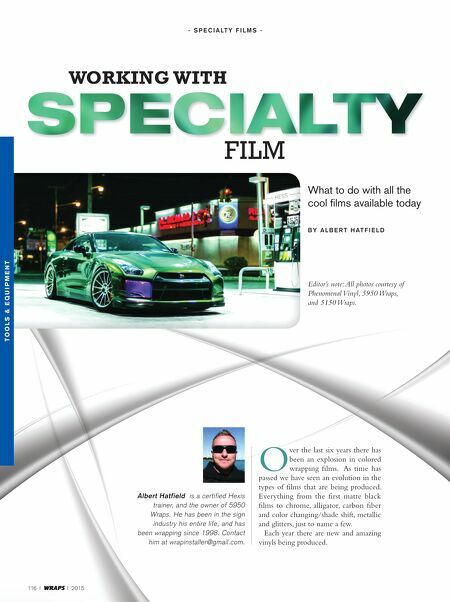 Albert Hatfield is a certified Hexis trainer, and the owner of 5950 Wraps. He has been in the sign industry his entire life, and has been wrapping since 1998. 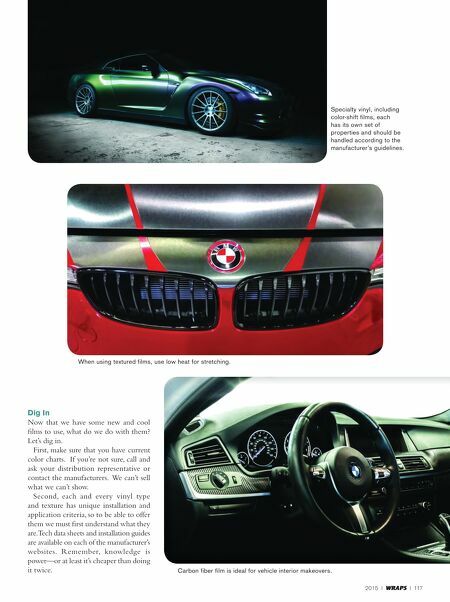 Contact him at wrapinstaller@gmail.com. T o o l s & e q u i p m e n T - S p e c i A lt y F i l m S - B y A l B e r t H A t F i e l d Working With FILM What to do with all the cool films available today Editor's note: All photos courtesy of Phenomenal Vinyl, 5950 Wraps, and 5150 Wraps.